The Book Rat: Teaser: Wendy Darling, vol 2: Seas by Colleen Oakes! Teaser: Wendy Darling, vol 2: Seas by Colleen Oakes! I'm back with another post in the Fall Favorite Things blog tour; this time, I'm sharing a snippet of WENDY DARLING, vol 2: Seas by Colleen Oakes! Colleen's favorite fall thing? "Colleen, like the rest of us, LOVES a good fall read. Let’s be real, there is nothing like sitting in front of the fire place with a glass of hot apple cider reading and an amazing YA book." Yep, that sounds just about perfect. From the author of Queen of Hearts comes the much anticipated sequel to Wendy Darling. 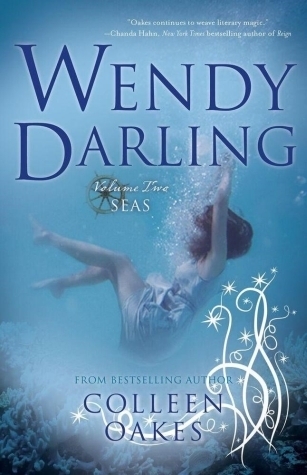 Wendy Darling: Seas finds Wendy and Michael aboard the dreaded Sudden Night, a dangerous behemoth sailed by the infamous Captain Hook and his blood-thirsty crew. In this exotic world of mermaids, spies and pirate-feuds, Wendy finds herself struggling to keep her family above the waves. Hunted by the twisted boy who once stole her heart and struggling to survive in the whimsical Neverland sea, returning home to London now seems like a distant dream - and the betrayals have just begun. Will Wendy find shelter with Peter's greatest enemy, or is she a pawn in a much darker game, one that could forever alter not only her family's future, but also the soul of Neverland itself? Yes, it does make Pan sound like a threat more than Hook. I'm curious about these. I'll have to find the first one and give this series a go.